In the midst of this winter weather, I am constantly looking for reminders that summer is around the corner, a glimmer of hope that warmer temperatures are coming. In order to achieve this, I start to think about my favourite summer destinations and the foods that remind me of those places. I love Italy and all the food and smells that come along with it. Is there anything more synonymous with Italian food than the mighty meatball? It wasn’t all that long ago that I had my first meatball sandwich. A-hole-in-the-wall restaurant with 10 items on a chalkboard menu; 20 seats, with non-matching plates. But the food was fantastic. The sandwich combined all the great flavours of Italy, wrapped up in a warm, crusty bun (that always needs to accompany good pasta to soak up the last bits of sauce) and all made it easy to consume. The combination of a crunchy bun, soft dough and a warm sauce just can’t be beat. These sandwiches are a perfect combo between the hearty winter meals that make us feel cozy and warm, and the fresh flavours of summer tomatoes and pesto that make us want to go outside and bask in the sun. Form mixture into meatballs, each slightly larger than a golf ball. Line in an high-sided ovenproof container in a single layer, so the meatballs are not touching. If mixture is overly sticky, add additional bread crumbs to make it easier to handle. Bake meatballs for 10 minutes. Reduce oven temp to 350°F. Add tomato sauce, and place back in the oven for an additional 20 minutes. Cut sandwich buns lengthwise in half and spread pesto on both sides. 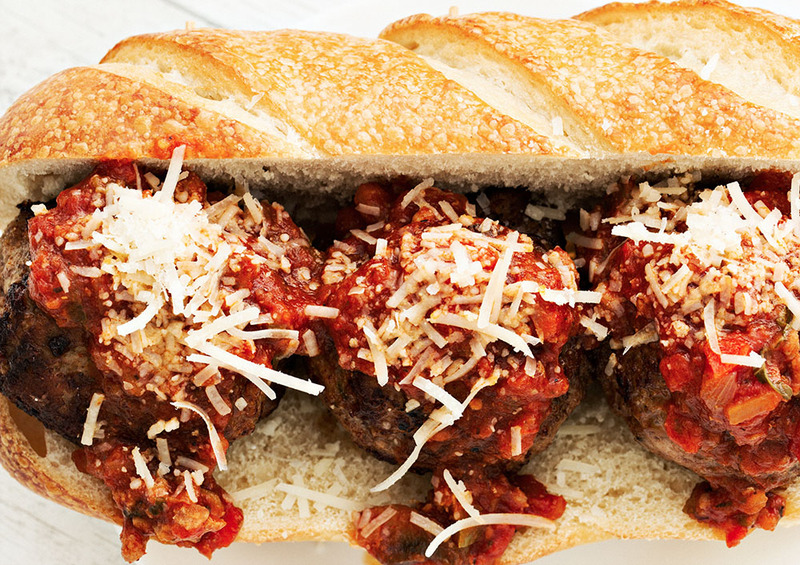 Add sauce and meatballs to buns, add Parmesan over hot meatballs, and cover with a little more sauce. Match: Serve with a nice wicker-covered Chianti (if you can find one).